enco are the real coffee experts since 1923 and have an extensive range of coffee and hot drinks available through their hot drink and coffee vending machines. In addition Kenco has set up a network of 20 branches throughout the UK offering a local service. Singles range - taste, quality and aroma of freshly ground coffee with the simple, convenient delivery from a unique mini-filter offering a fresh drink every time. The equipment requires minimal cleaning and is extremely reliable. There are 18 branded drinks - 9 coffees, 4 teas, 2 Twinings herbal infusions, Suchard Chocolate and Kenco Cappio. In-cup range - consistent quality delivered quickly and without mess, time and time again. Supplied in branded paper cups* -preferred choice by consumers (*Kraft Foods Research 2007 ) reassuring of Kenco quality. Other brands include Bovril, Knorr soups, PG Tips and Suchard Chocolate. The Kenco Coffee Company are not just passionate about great tasting coffee, but also about ensuring a sustainable future for coffee farmers. For well over a decade Kenco have been working in partnership with Non-Governmental Organisations on sustainability initiatives around the world. Kenco's partnership with the Rainforest Alliance is the latest of these and will help to provide farmers and their communities with environmental, social and economic benefits for years to come. What is the Rainforest Alliance 'certification'? 'Certification' by the Rainforest Alliance is a signal that a farm has met rigorous standards that conserve biodiversity and provide sustainable livelihoods as well as a guarantee that high social, economic and environmental standards are being met. Kenco Sustainable Development is a range of Kenco coffee products made entirely from coffee farmed on Rainforest Alliance CertifiedTM farms. The Kenco Sustainable Development range contains only high quality Arabica beans, giving a rich, full aroma and a smooth, distinctive taste. Excellent understanding of their products and of customers requirements that enables them to offer the right product in the right place. The best equipment and product range is identified to match your needs. Expertise in working closely with customers in a partnership relationship offering the right expertise throughout their business via training and after sales support service. Giving the customer the right offer (best equipment, preferred purchase option, flexible contract) and continuing to offer new products and improvements to adjust to changing tastes. 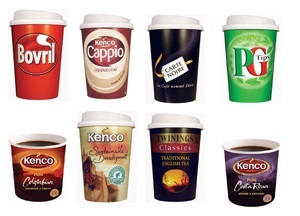 The Kenco FreshSeal range has the look and feel of coffee shop style cups that your customers won't be able to resist. You will love this solution too, as these cups not only look fantastic, but can also be stored securely and served anywhere easily and quickly - all you need is hot water! To complete the offer, plastic sip lids, milk jiggers, sugar sticks and wooden stirrers are also available. Just like your customers, Kenco Local love great hot drinks, which is why they have chosen a fantastic range of well-loved brands for the Kenco FreshSeal range. Their choice of coffees includes Kenco Rich & Smooth, Kenco Decaffeinated, Kenco Sustainable Development and Carte Noire. To enhance your range, why not add Suchard Hot Chocolate drink and Kenco Cappio to offer a sweet and indulgent treat, and then decide between PG Tips and Twinings Traditional English for your tea offer.